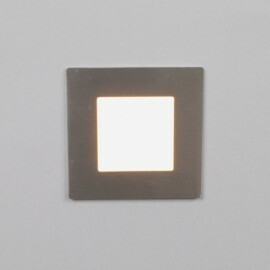 Elegantly designed energy efficient square recessed LED Plinth light. It features an evenly illuminated silk-screen glass and stainless steel front bezel. This mains fitting requires no additional power supply or LED driver. Suitable for interior or exterior use - IP68 rated Ideal for Kitchens, where mood or background lighting is required. Not suitable for dimming, Supplied with snap-fit plastic rear housing for easy installation.